Our Club Yearbook competed at the VFGC state level and I will keep you posted of any further recognition. DISTRICT III – Presented one of our members with the 2016 Perennial Bloom Award. Long time member, Bernie Donaldson, was recognized at the June 17, 2016 District III Presidents’ Coffee at Meadowlark Gardens. We should note that Bernie, although now a sustaining member of RSGC, entered our April That’s Life Standard Flower Show, and received the TOP award for her amazing african violet. We are SO proud of her accomplishments and glad for her long time membership in Rock Spring GC. Congratulations, Bernie!! 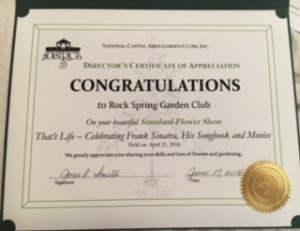 RSGC also received recognition from District III for our Standard Flower Show, That’s Life, held April 22. At the National Garden Clubs’ Convention in Grand Rapids, Michigan, it was my pleasure to accept the awards that our Virginia Federation of Garden Clubs’ members won. I am very proud of Rock Spring Garden Club members and all the work you all do for your community. I am glad to see the club receive recognition for its accomplishments. I will be mailing you the awards for your club. 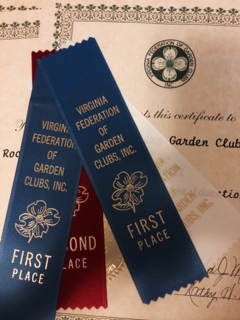 Congratulations to the club for all the awards it won from Piedmont District, Virginia Federation of Garden Clubs, and National Garden Clubs. Please continue to apply for awards. Your club members not only do the work but you know how to apply and win awards. IT’S QUITE EXICITING TO RECEIVE TWO NATIONAL AWARDS FOR OUR WORK DURING THE YEAR! In addition, District III won Award #1 The Beatrice M. Coiner Award for Community Projects ($150) for the DistrictIII Garden Tour and Faire that our club worked on with all the other clubs in District III. In addition, DIII received an Award #21 A for Outstanding Publications for the Garden tour and Faire Photo Books and Faire Ticket & Tour Guide. Plus! #34A Website DistrictIII Garden Spaces Electronic Maps. 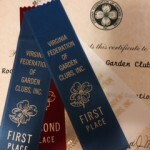 All these State Awards were also submitted to National Garden Clubs for consideration for National awards. Those awards will be announced in May at the NGC Convention and we’ll let you know what happens!! Many thanks to all of you who worked as docents for the garden tour, refreshments, attended the tour and bought and sold tickets. That event yielded approximately $6000 which was redistributed to Green Spring Regional Gardens for their gazebo restoration project and District III’s Grant for Membership Initiatives program, as well as other on going programs and future projects. Thank you! While there is great purpose to the work of each and every committee in RSGC for which to be proud of, we know we don’t work so hard and tirelessly to make every project we do successful and meaningful, just to receive Awards. It is the job of the Awards Chairperson, though, to make sure you all do receive the recognition you’ve earned. 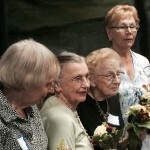 We have worked for many years to create wonderful community partnerships and service projects like Garden Therapy, Youth Activities, Garden of the Year, Holiday Design Event, Floral arrangements for community events and organizations, Outdoor Lab Scholarships, Rock Spring Park, producing a wonderful newsletter, and a very detailed yearbook to serve our members, and offer educational and informative programs that are free and open to the public. Our Ways & Means support our endeavors and our wonderful hospitality continues to nourish us. Really, every committee works to support the whole organization. No one stands alone in this club. District III Perennial Bloom Awards – On September 18, 2015, two RSGC members were recognized at NCAGC’s District III Fall Meeting. 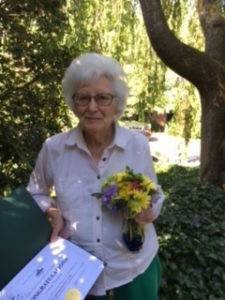 Florence Otstot and Alice Conrad received floral bouquets and a Certificate of Appreciation from Jane Smith, District III Director, in recognition of their many years of service and membership in Rock Spring Garden Club. Florence joined RSGC in 1965 and celebrates 50 years of membership. Alice joined RSGC in 1971 and celebrates 44 years with our club. Both served in many leadership positions, including RSGC president. Alice and Florence remain busy with club activities and are beloved by all our members. Congratulations to them! 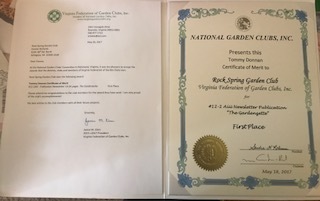 Rock Spring Garden Club was recognized for their achievements in 2015 by National, States (Virginia and National Capital Area Garden Club), Region (C.A.R. ), and Districts’ (VFGC Piedmont and NCAGC District III) organizations. We are humbled and thrilled to receive such recognition. Thank you. From National Garden Clubs, Inc.
From Virginia Federation of Garden Clubs, Inc.